Did you know you can sew craft foam??? Since everyone adds stitches to felt shapes we thought we would give it a try with foam shapes. Just for fun we added a few stitches around a foam circle to see how it would look. Well, it worked and was no harder to sew than felt! Once we stitched the perimeter of the foam circle, we added the circle to the center of a foam flower and then attached a green foam spiral to create these amazing Hanging Foam Flowers!!! They can be hung indoor or outdoors. Not to mention flowers can be custom-made in any color you need to match your next event, party, or wedding! Of course, if you don’t want to “sew” on craft foam, you could use Glue Dots to attach the foam shapes, hole punch the top of the flower and add ribbon, baker’s cotton, or embroidery floss to hang. We thought these flowers looked so cute all stitched up, though. 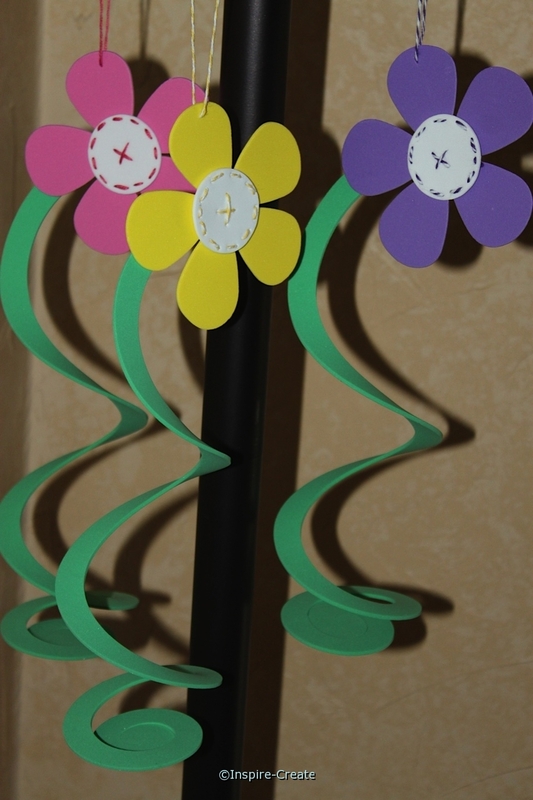 Oh, and did we mention if you hang them outside the flowers will spin because of the spiral stem! 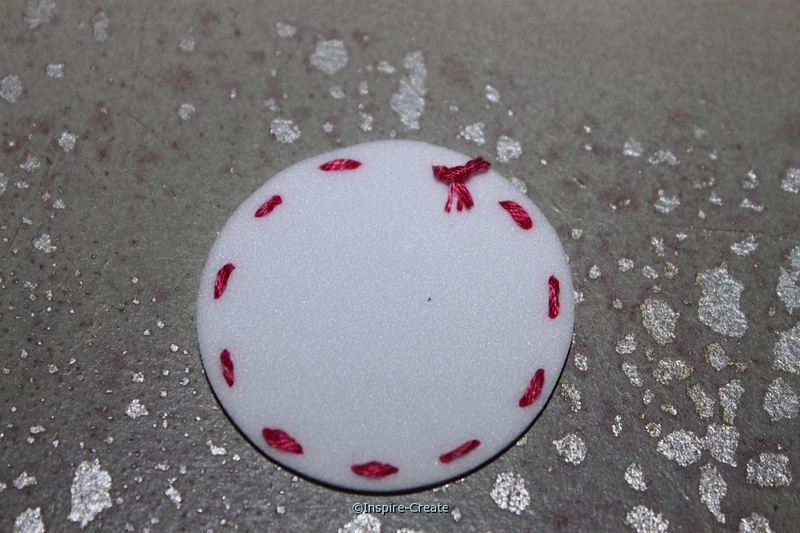 Starting with a 1 1/2″ foam circle (white or any color you like), stitch around the edge with small stitches as shown below. 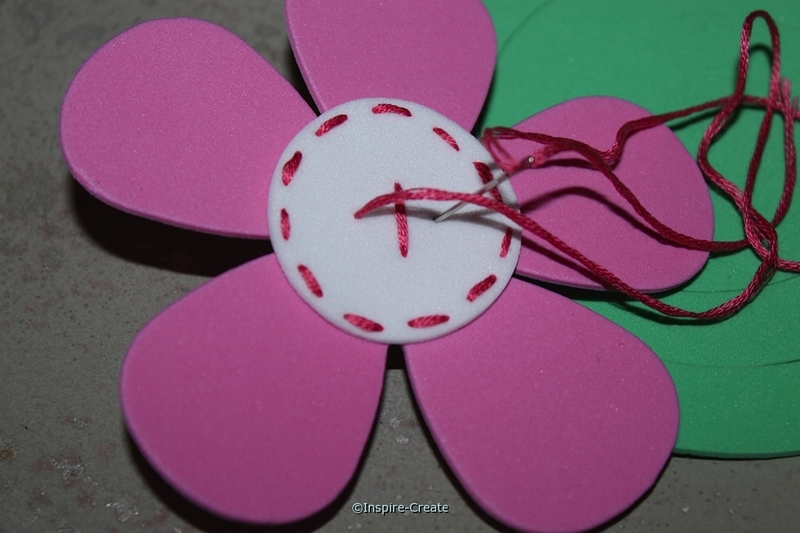 To match the Hot Pink Craft Foam Flower, we used DMC #335 Embroidery Floss and an Embroidery Floss Needle. 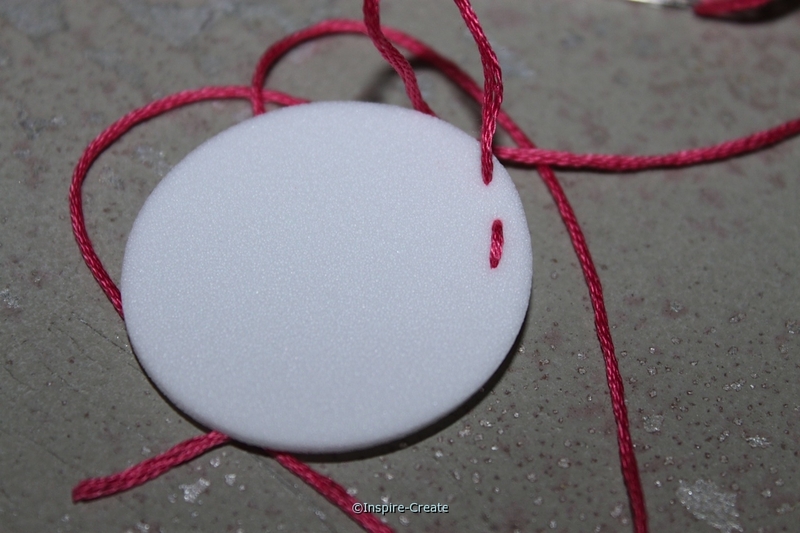 Tie off ends behind the foam circle to secure the embroidery floss. Here are a few other options for sewing on craft foam include: Baker’s Twine and Baker’s Cotton! We actually used all three to create these hanging flowers. The Hot Pink Flower has DMC Embroidery Floss, the Purple Flower has Purple Baker’s Cotton, and the Yellow Flower was stitched with Baker’s Twine. 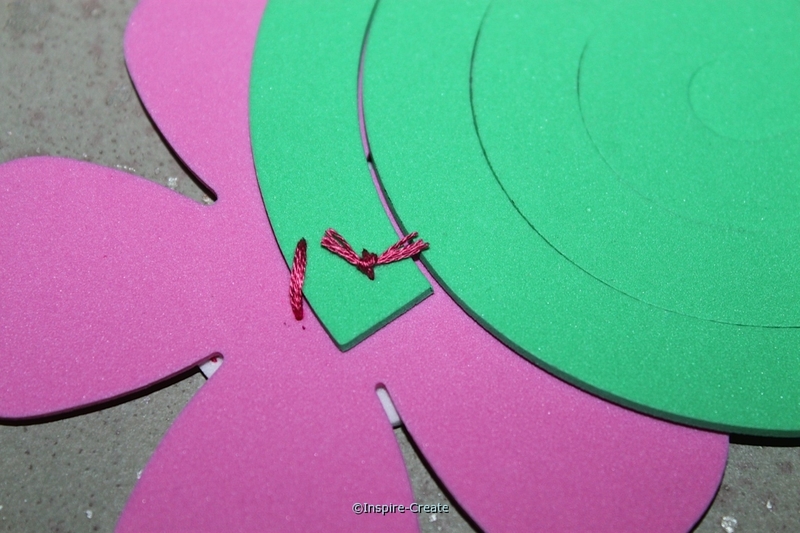 Once the foam circle is stitched, attach it to the center of the flower and at the same time attach the Green Spiral Stem to the back of the flower. This can be done with a simple cross stitch through the center of the circle. Next, tie off ends of floss to secure and trim excess embroidery floss. Now, add a short piece of embroider floss (baker’s cotton or twine) to the top petal of the flower for hanging. 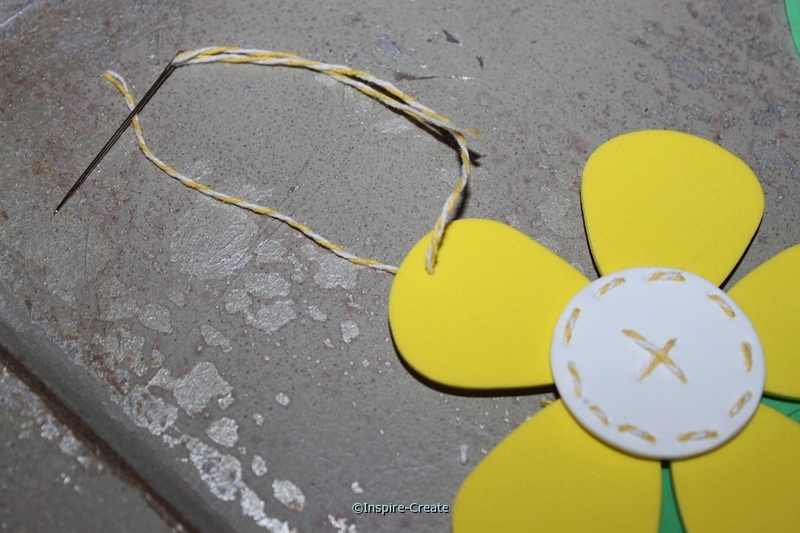 For a “No Sew” version of the this craft (for small children) use Glue Dots to attach the center of the flower and the stem for a no sew hanging flower! 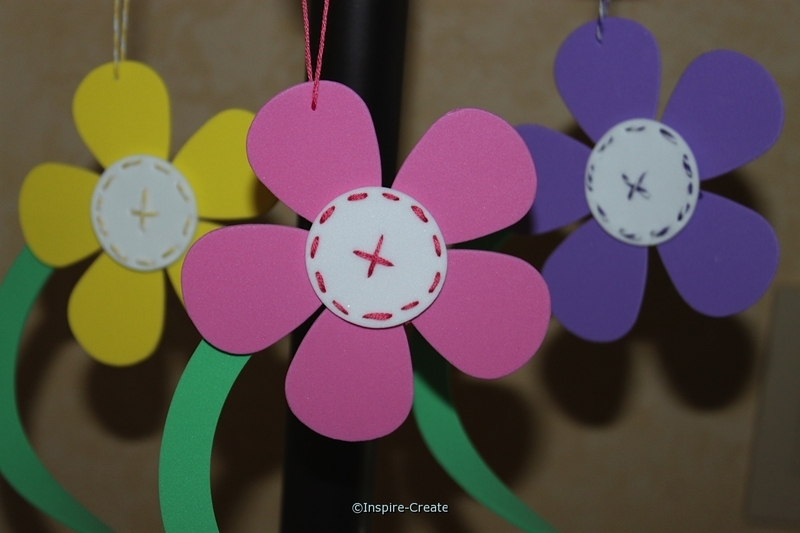 Stitches can be drawn on the circle with a permanent marker or the circles can be pre-stitched so children can just assemble the flowers and hang. Since the breeze blows here and the hanging flowers spin, we recommend attaching a flower on the back side of the stitched flower for a finished look. Attach the back flower with a Glue Dot placed right over the stitches on back of the stem. Hanging Flowers even lie flat for easy storage! 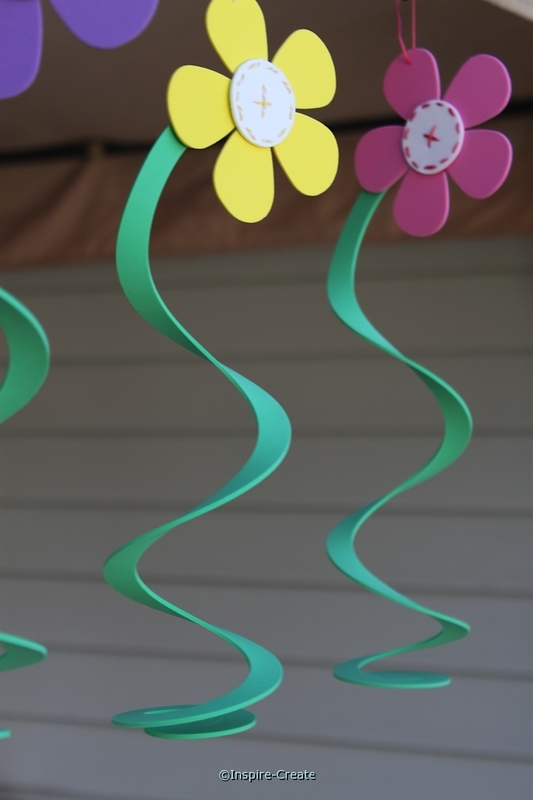 These are the perfect party decorations for a summer event, girl birthday, pool party, or an outdoor wedding! Flowers, Circles, and Spiral Stems can be custom-made in the colors you need. Be sure to tell us what you think! Post a comment below.